James Comey testifies before Senate Intelligence Committee	(www.startribune.com). Here’s part one, and here’s part two. 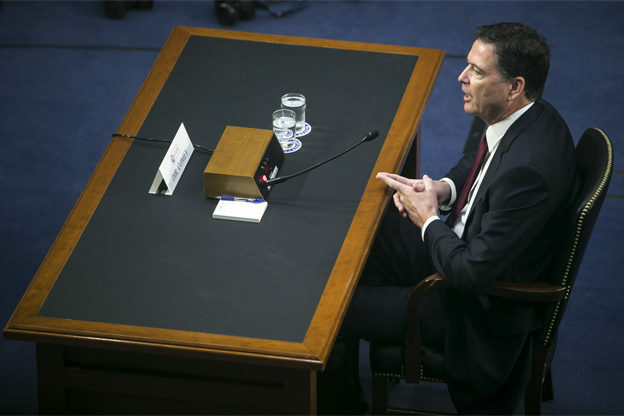 It was fun to watch; the feed I had on the computer showed only James Comey, and not the Senate panel members; Comey only shifted around to face the senator asking him questions at the time, never referring to notes, because he didn’t have any. But you could often hear papers shuffling around in the background. You could even hear who was in control. It was as though Director Comey had invited the senators to come and listen to what he had to say. 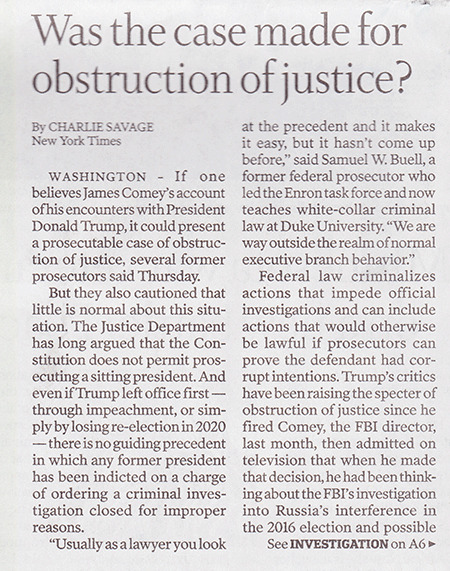 Charlie Savage writes that the Justice Department has “long argued” that a sitting president cannot be charged with a crime. As you can read in part two, however, that is hardly a universal sentiment in the legal community, and perhaps it is a view that Special Counsel Mueller doesn’t share. I guess we’ll see. As for a criminal charge after leaving office — however that might occur— it seems certain that Gerald Ford thought it was possible, pardoning Richard Nixon “for any crimes he might have committed” in office. The pardon was probably part of the negotiations to get Nixon to resign. That might echo here, too, especially for somebody who wrote, or paid somebody to write it for him, a book titled The Art of the Deal. Update: And now there is this (Michael Dreeben was the deputy solicitor of the United States). This not a promising development for the president. Never send for whom the gong sounds; it sounds for thee.